Recent studies show that “fast, effective onboarding” is one of the top challenges holding back today’s sales organizations. Yet conventional approaches to onboarding often just waste time, and fail to prepare new reps to hit the ground running. 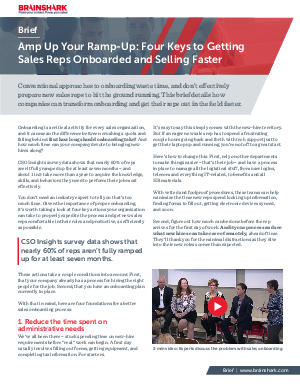 This exclusive brief details how B2B companies can transform and accelerate the sales onboarding process – and cut the time it takes new reps to close their first deals. Get your copy today to find 4 new ways to amp up your team’s ramp-up.